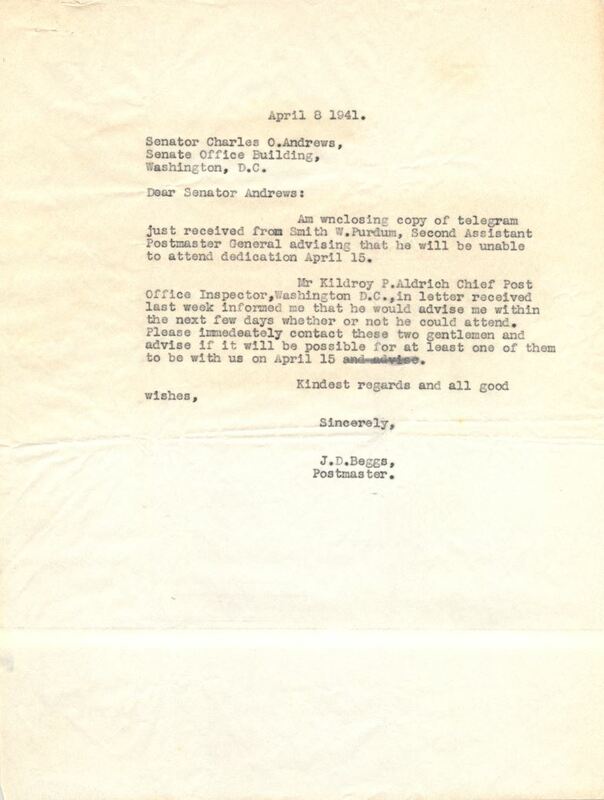 A letter from Orlando Postmaster James D. Beggs, Jr. to Senator Charles O. Andrews (1877-1946). In the letter, Beggs informs Sen. Andrews that he has received a telegram from Smith W. Purdum, the Second Assistant Postmaster General. Beggs also inquires as to whether Sen. Andrews can determine if Kildroy P. Aldrich, Chief Post Office Inspector, will be present for the dedication of the new Downtown Orlando Post Office of April 15, 1941. Original letter from James D. Beggs, Jr. to Charles O. Andrews, April 8, 1941: Private Collection of Texann Ivy Buck. "Telegram from Smith W. Purdum to James D. Beggs, Jr. (April 8, 1941)." RICHES of Central Florida. https://richesmi.cah.ucf.edu/omeka/items/show/7616. 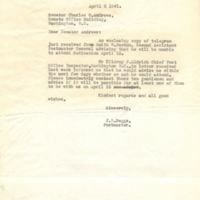 Beggs, James D., Jr.. “Letter from James D. Beggs to Charles O. Andrews (April 8, 1941).” RICHES of Central Florida accessed April 19, 2019, https://richesmi.cah.ucf.edu/omeka/items/show/7617.